The Facebook is testing a new feature that will make it easier for you to watch videos when you are on the move. Dubbed as Instant Videos, the social network is currently testing it on a small number of people. The feature was first spotted by The Next Web’s Matt Navarra and was later confirmed by TechCrunch. Facebook Instant Videos will pre-load videos when you are connected to Wi-Fi and hence saves your mobile data. These videos will also load faster and have no load time before viewing. 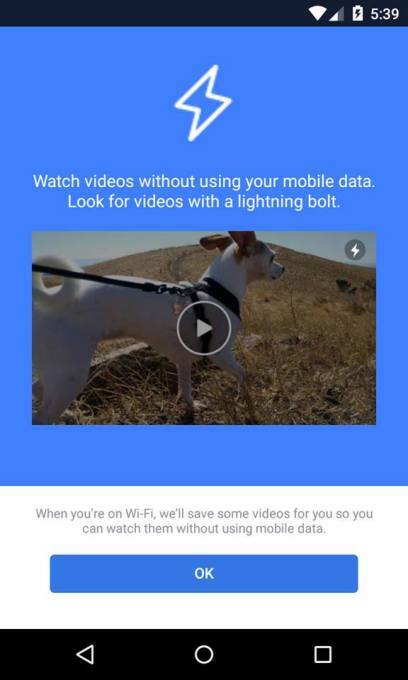 Facebook marks the videos you can play without using up your data with a lightning icon. The Instant Videos feature is similar to the Instant Articles feature that was first launched in 2015. The latest move from Facebook shows is ramping up video experience on its platform.The social network has been bolstering its video efforts as it recently rolled out Watch video platform which will roll out an array of original shows along videos from other creators to a small group of U.S. users on mobile, desktop and Facebook’s TV apps. It is not clear when or if Facebook will roll out the Instant Videos feature to a larger audience.